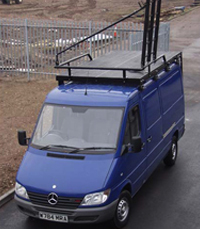 FDS Van Platforms can be manufactured to suit a wide variety of current commercial vans. All systems are constructed using an aluminium structural base frame which is covered in an aluminium platform decking and can be fitted with either side restraints or grab handles. The completed structure is powder coated to the required colour and the main tread area grip coated for added safety. High specification systems are available with full ladder installation RIS tubes and a double width access ladder. 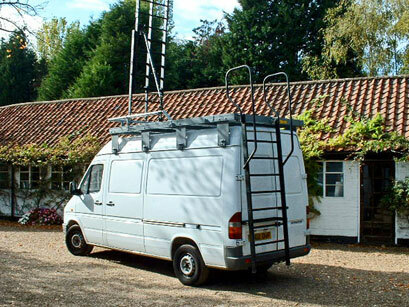 The main heavy duty combination ladder and aircraft gantry used on the C-RIS and intervention vehicles can be fitted directly to the RIS tubes providing a cost effective Multi function vehicle. Such a large capacity vehicle enables large numbers of operatives to move and deploy to a variety of targets from the top platform and ladder system. 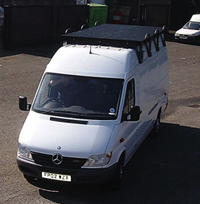 The Mercedes base vehicle can be provided with zoned protection to the frontal arc, sides and roof.